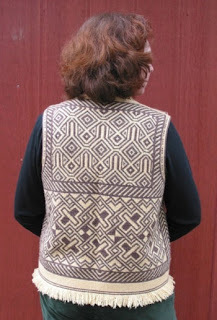 As promised a post on personalized knitting - the first of many, I hope! In fact I got the idea for the post from my very good friend Brenda, whom I have known for over 25 years and have known as a knitter for 15 years - I know this sounds strange but for the first 10 years of having Brenda around for dinner or meeting her at parties, I had never known that we shared the same passion. Knitting must still be a "closet thing" unless you are with kindred souls. The truth came out one night after dinner at her house when I noticed a Barbara Walker book on her book shelf - "Do you knit!!!" I asked - "Yes, have for years," was her answer - Eureka! a friend re-born! 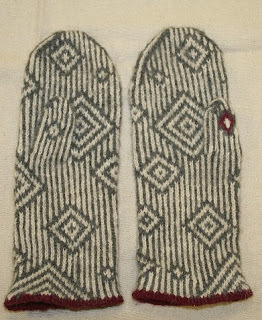 Well Brenda came over one winter's night for dinner and brought her Paradoxical Mittens, knit from Lucy Neatby's pattern. She had, however, made these "Brenda's mitts", by knitting a small portion of the design on the right thumb in the contrasting cast on colour - so that you could always tell your right mitt from your left. 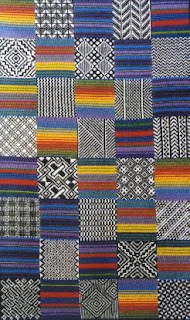 The pattern itself is fabulous - inspired by the basket weaving designs of West African artists - Lucy Neatby has travelled the world and incorporated many ideas from her travels into her knitting patterns. However, Brenda's idea for the thumb is ingenius!